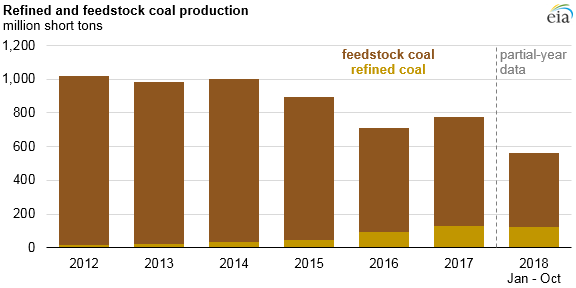 Despite predictions that US coal production and use are doomed, Trump policies are sparking an increase in “clean coal”, i.e. refined coal. Activists/alarmists say there is no such thing as clean coal, but as usual they conflate actual air pollution with CO2 emissions, which are plant food rather than toxic. 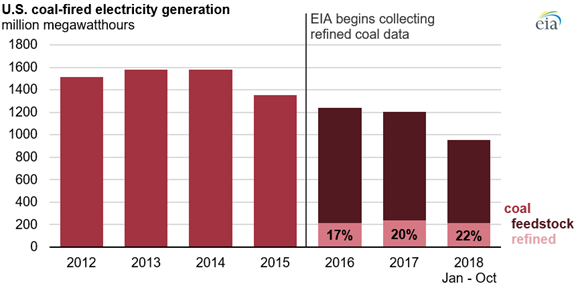 A recent article from EIA explains the rise of refined coal U.S. production and use of refined coal continues to increase. Excerpts in italics with my bolds. Nitrogen oxides (NOx), Sulfur dioxide (SO2), Mercury (HG), and Particulate matter (PM). The combination of refining the coal feedstock along with scrubbers is removing the actual environmental hazards. What is left is the unproven claim of global warming/climate change as the reason to deprive people of the benefits of burning coal for gaining power. Power to the people indeed. Back in the late 70s a Congressional report titled “The Direct Use of Coal” calculated 45,000 premature deaths a year due to coal pollution. Anti-nuclear fanatics seized on this with whoops of joy, since their entire agenda fits a scenario in which electric power is totally illegal, just as Republicans seek to revert to the Comstock laws of 1873 and make all mention of birth control a chain-gang felony. These advanced coal technologies are desperately needed in the developing world.